Posted by Dr. Krishna Kumari Challa on July 10, 2017 at 10:07am in Science Simplified! Krishna: Danger lies with the person who uses science in the wrong way, not science . Some people complain that science also brings with it a few bad things like commercial GM crops, nuclear bombs etc. along with the good it does to the mankind. But according to the scientific community – science is like a knife. A knife can be used to cut throats and spill blood. It can also be used for good purposes like cutting fruits and vegetables. It depends on the person who uses it. Likewise science can also be used for the benefit of living beings as well as for their destruction. Which way it goes is in the hands of the person who uses it. The choice is definitely yours, Homo sapiens. Q: Why does science tell us race is just a social construct, even though we can clearly tell what race people are? Surely there has to be some basis to it, otherwise how can we tell an Indian from a German? Krishna: There might be slight differences like skin colour, height, eye colour, hair colour, which can have exceptions too. Indians can have 'German looks' and Germans can have 'Indian looks' because of slight genetic variations but they need not be general rules. Regional adaptations play a role but these tend to express difference within so-called races, not between them. But you cannot categorize people into races based on these small genetic variations. Q: Why did my vegan and non-smoker 38 year old sister die due to lung cancer while my grandpa died at 93 as a pure tobacco smoker due to ageing? Krishna: Did your sister live in a highly polluted environment? And your grandfather lived in a healthy environment? Did your sister inherit her dominant genes from another grandparent - not your grand father - and had genetic pre-disposition for cancer? Did your sister have influence of epigenetic factors? Did your sister eat poor nutritional value diet? Was your sister overweight and your grandfather the right one? Did your sister live a sedentary life? What was your sister’s biological age? Did your sister come into contact with other carcinogenic products more than your grand father? Was your sister exposed to second hand smoke? You have to answer several of these questions before coming to a conclusion! Because several factors influence cancer’s origins and development, not one. Q: Why do some people get lung cancer even though they don't smoke? Primary factors closely tied to lung cancer in never smokers include exposure to known and suspected carcinogens including radon, second-hand tobacco smoke, and other indoor and outdoor air pollutants. Several other exposures have been implicated. Please read the answer above to have a better understanding on this. Q: Do miracles actually happen or its just a mere belief? Krishna : Miracles are miracles only until … explained by science. Miracles are real wonders for the uninformed mind. While intuitive thinkers feel it is magic, reflective thinkers are more likely to see the event as a statistical fluke. Feeling that something is a miracle denotes your state of mind, your perception quotient (PQ). Q: Why do people behave stupidly when they are in love? Krishna: This is called motivational reasoning ( biased thinking) where emotions rule your thought process. You want to have a positive relationship with your loved ones. You want to have a positive image of your loved ones to be happy around them. Then you search rationally for information that either confirms or disconfirms a particular belief, people actually seek out information that confirms what they already believe in. This is a form of implicit emotion regulation in which the brain converges on judgments that minimize negative and maximize positive affect states. This reasoning is not only bad for you but also for your loved ones because your praise no matter how badly they behave, makes them blind to their own black spots. Hormones in your body like testosterone and oestrogen, dopamine , adrenalin. serotonin - these bio-chemicals may actually manipulate your brain when you are in love. Oxytocin takes you to a high and really tweaks your brain. And you lose your mind and go mad! The frontal cortex, vital to judgment, shuts down when you fall in love. MRI scans show this de-activation occurs only when someone is shown a photo of the person they adore, causing them to suspend all criticism or doubt. When you look at someone you are passionate about, some areas of the brain become active. ‘But a large part is de-activated, the part that plays a role in judgment.’ the brain may behave in this way for ‘higher biological purposes’ – it makes reproduction more likely. If judgment is suspended, the most unlikely pair can get together and reproduce. The love chemical we are most familiar with is adrenaline. This hormone is why our heart races, palms sweat and mouth goes dry when we see the person we like. Scanning of brains of people in love shows that there is clear cut pattern of brain activity when they were looking at their new love. Four areas of the brain became active, and one area noticeably inactive, when the subjects had love on their mind. The active areas include one responsible for 'gut' feelings and one that is known to respond to euphoria-inducing drugs. The lights go off however, in the prefrontal cortex, an area that is overactive in depressed patients. Q: Why do people place a lot of faith in Astrology? Krishna: Why do people place faith in several irrational things? When they lose faith in themselves, when their lives and minds are in a chaotic state, when they fear something, when others mislead them, and when they cannot think critically. Q: What is that white camphor like material people are using now-a-days in ice cream packs that looks like releasing some gas? Is it safe to use? Krishna: Dry Ice! it is the solid form of Carbon dioxide. It is being used as a cooling agent. It is safe if it doesn't come in touch with the skin. Prolonged exposure to dry ice can cause severe skin damage through frostbite, and the fog produced may also hinder attempts to withdraw from contact in a safe manner. Because it sublimes into large quantities of carbon dioxide gas, which could pose a danger of hypercapnia - also known as hypercarbia and CO2 retention, is a condition of abnormally elevated CO2 levels in the blood - dry ice should only be exposed to open air in a well-ventilated environment. If large quantum of the substance is inhaled, it causes breathlessness and loss of sensory. For this reason, dry ice is assigned the S-phrase S9 in the context of laboratory safety. Industrial dry ice may contain contaminants that make it unsafe for direct contact with foodstuffs. It is safe provided it is all consumed once it is vapourised. Dry ice is extremely cold! Skin contact kills the cells, giving you a dry ice burn. ... Don't eat dry ice. If you use it to cool a drink, be careful that you don't accidentally get a piece of dry ice in your mouth or accidentally swallow some. No it will not poison you to drink a liquid that is directly cooled by dry ice. At normal pressures there may be some gaseous CO2 dissolved in the liquid giving it a mild carbonation. However, dry ice can be dangerous to bare skin, mouth, or GI tissue if someone swallows a medium to large pieces of dry ice. Small pieces are not poisonous, but can produce an unpleasant popping or tingling sensation in the mouth (like extra tingly PopRocks). In a process similar to making liqiuid nitrogen ice cream, dry ice can even be used to make ice cream if it is crushed very finely. Always wear protective clothing while using it. Use it in a well ventilated place. Use gloves that are insulated while handling it. Do not store it in air-tight containers, the sublimation of the ice into gas will cause the container to explode. Do not store dry ice in refrigerators or freezers. Store in the best insulated cooler possible. 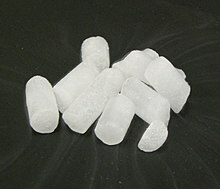 Do not pack dry ice in direct contact with glass bottles, jars, etc. as the glass could crack and shatter; use non-glass containers. Do not use dry ice in individual drinks. Never allow children to play with it. Under no circumstances should dry ice be placed in the mouth. As the cool carbon dioxide gas sinks to the floor of a room, the increased concentration of CO2 is more likely to cause problems for pets or children than for adults, both because they have a higher metabolism and because they may be closer to the floor where the concentration of carbon dioxide is highest. Q: A lot of scientists say and prove that the earth is flat. Why? How can this be explained? Krishna: This Q doesn’t sound correct. If a ‘scientist’ says the earth is flat, s/he is not a scientist in the first place. So the scientists you are talking about are pseudo-ones. No scientist can prove that the Earth is flat because it is not! You must be under a delusion to believe in this false propaganda. Q: Why can't children and adolescents think as well as adults do? Krishna: The frontal lobe of the brain is not fully developed during childhood and adolescence, which is why our abstract reasoning skills are much better as adults. The frontal lobe is responsible for abstract thinking as it combines and integrates sensory information from the rest of cortex, allowing conclusions to be made and rational thoughts to be developed. Q: Why do we catch cold more in cold temperatures? Krishna: A team of scientists from Yale University conducted research on this and found that that lower temperatures weaken the nose’s first line of immune defenses. But at a relatively cool 91.4 degrees Fahrenheit, it was found, things changed. The neighbouring cells only managed a weak defense, allowing the rhinoviruses to invade them and multiply. This result pointed to an explanation for why rhinoviruses plague humans at low temperatures: In cool conditions, the immune system falters. Temperature-dependent innate defense against the common cold virus limits viral replication at warm temperature in mouse airway cells (2). Two interferon-independent double-stranded RNA-induced host defense strategies suppress the common cold virus at warm temperature (1). Q: What does 'decolozation of science' means and involve? Krishna: Decolonization of science means several things to different people. For some decolonizing the science would mean doing away with it entirely and starting all over again to deal with how we respond to the environment and how we understand it. For some science must address their local issues too. For some science must ‘include’ people from all regions of the globe. For some science must represent both genders equally. Science must remove the feelings of alienation in some people. For some science is ‘racist’ and therefore, must be abolished! For soem as it is going wrong, it must be ‘reset’. For some, it must be completely removed because as they say ‘it originated from a particular part of the world’ and represents it and it doesn’t belong to them! I personally think, science is universal in nature and can never be regional. People handling it and funding the scientific world should realize this. Scientific knowledge should benefit whole of humanity. It should be made available to everybody on this planet without any reservations. Decolonizing science really means leaving it alone without any interference from religious, political, regional, emotional, biased and other influences and make it completely independent. Making science ‘Universal’ leads to more effective, productive results. Q: What do you think of this video on decolonization of science? Krishna: Although it represents a view originated in frustration and misinformation, it is not the right way to go about in science. Science is universal and the closest thing to facts. It is a systematic unraveling of mysteries of nature. And the best tool to do that when the scientific method is used correctly. Deviating from it or going away from it takes us back to ‘dark days of human history’.